Yield, merge and zoom ahead on Nebraska’s roadways with the 2019 Audi A8. 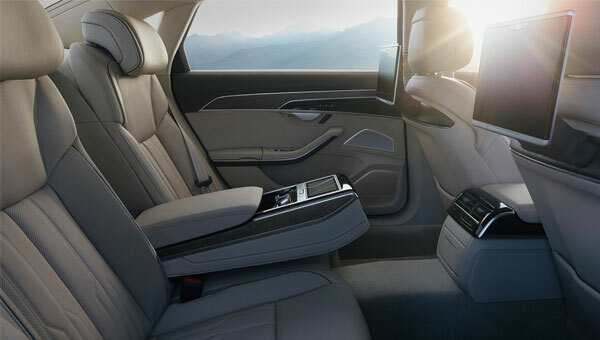 The new Audi A8 combines pure comfort and relaxation with its first-class cabin features, and it helps provide a jolt of energy and passion with its incredible capabilities. Next-generation driver-assistive features allow you to accelerate with peace of mind, while state-of-the-art infotainment systems offer you and your guests entertainment perks in spades. Interested in learning more about the 2019 Audi A8? Visit our Audi dealership in Omaha, NE, today! From HD Matrix headlights and Intelligent OLED taillights that will help light your way across the Great Plains to a newly redesigned exterior that’s augmented by a new front fascia with prominent Singleframe® grille, the 2019 Audi A8 sedan is the complete package. Use a Premium 3D sound experience to listen to all your favorite tunes, and upgrade to include the Executive rear seat package so your guests enjoy each ride to the fullest. Bask in this new Audi sedan’s elegant leather seating and make the most out of warm and sunny days with a Panoramic sunroof. Have we told you about the technology? 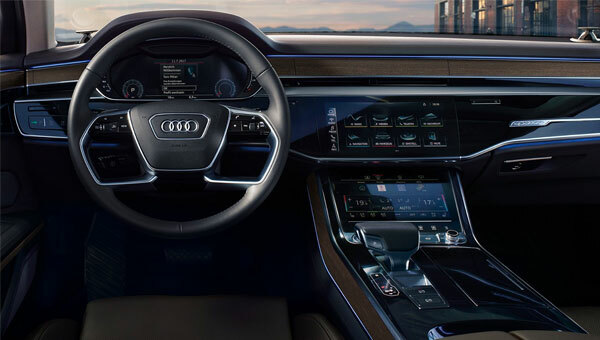 Audi engineers continue to innovate with the 2019 Audi A8. You’ll love Audi MMI® touch response, which lets you access everything from your phone settings to navigation with the easy aid of two touchscreens. The Audi virtual cockpit harmoniously syncs with Audi connect® for a 3D navigation experience. When it comes to advanced safety features, you’ll love the Audi adaptive driving assistant that monitors the traffic ahead and helps you maintain a safe distance from the vehicle in front of you. Plus, there’s also the Audi pre sense® 360 system that combines Audi pre sense® basic, front, rear and side functions to give you unrivaled awareness as you drive. The 2019 Audi A8 is coming soon to Audi Omaha. Contact our Nebraska Audi dealership today and discover how you can finance this new Audi luxury sedan.